Colt Cowls have been solving chimney problems since 1931 when the original Colt Cowl was first introduced. Since that time over 4 million Colt chimney cowls have been sold and successfully installed. Colt Cowls have lead the market for the past 80+ years. Up until the 1980's the only anti downdraught cowl Colt Cowls produced was the original square Colt Cowl. However, during the 1980's partly in response to the increasing DFE (Decorative Fuel Effect) gas market, the Colt Top ALL PURPOSE was introduced as the first omni directional anti downdraught cowl. The Colt Top is still sold with the unconditional Money Back Guarantee the company is renowned for. Since the 1980's Colt Cowls have introduced many new products to the market and forged into new and different areas within the chimney industry. Because Colt Cowls have been making chimney cowls for over 80 years, you can be sure our offer has stood the test of time! All Colt Cowls are manufactured in an ISO 9001 certified factory, and where relevant are tested and certified to BSEN- 1856-1:2003 or BS5871. The flue systems sold on this site and in the Colt Cowls Catalogue are also HETAS listed and CE marked where relevant. Most Colt Cowl products are manufactured from high quality aluminium alloy and stainless steel. Colt Cowl products have been designed to withstand normal operating temperatures in chimney flues. 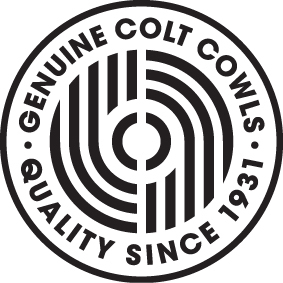 Since 1931, millions of Colt Cowl products have been installed. On certain products an unconditional Money Back Guarantee is offered. Experience has shown that only in isolated cases will our product range fail to solve the problem encountered. If, having installed the product correctly, the problem still remains, simply return it to the place of purchase within a reasonable period, with full proof of purchase, for a full refund. The MBG applies to all products with the MBG symbol displayed. This guarantee will not apply where a product has been subjected to temperatures in excess of the recommended operating temperature and where excessive wind speeds are experienced.